The memorial is finished. A bench sits outside a retired metal-recycling plant in Monaca, Pa., a memorial to two workers who lost their lives when an explosion in a refinery column triggered a fire. As of this month, that was four years ago. The plant has sinced closed and, with the help of an Eagle Scout, the bench is being moved off the abandoned lot and into town. When it arrives, the bench won't just be a memorial; it will be a painful reminder of a promise unfulfilled. After the fire, a federal agency was tasked with studying the causes of the fire and then filing a report on how to keep a similar fatal accident from happening again. But that report is yet to materialize, and the friends, families and coworkers of the two men—James Taylor, 53, and Corey Keller, 41—are still waiting for answers. "We have two families out there wondering what happened to their loved ones," said John Jeffers of the local United Steelworkers union. "Was it caused by an accident where someone made a wrong move, or was it caused by company neglect or something else? We won't know." 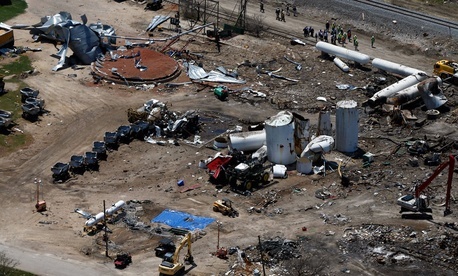 Monaca's story is an increasingly common tale for the Chemical Safety Board, the agency whose principal purpose is to investigate and issue recommendations on chemical disasters like the 2013 fertilizer-plant explosion in Texas that killed 15 people or the January chemical spill in West Virginia that left thousands without clean water. But the reports aren't coming as intended. The board's leadership paints a picture of a pinched agency hitting above its weight class, producing substantive reports that will change safety policy going forward. But a host of current and former employees blame Chairman Rafael Moure-Eraso and his inner circle, accusing them of creating a dysfunctional work environment that has left the board's employees in despair and their work in shambles. Regardless of who's right about the agency's trajectory, there's no question about its current reality: Unfinished cases have piled up, and the critics are piling on. The Chemical Safety Board was created in the 1990 Clean Air Act amendments to study chemical disasters and issue recommendations on how to prevent them in the future. The board has no regulatory power—its influence is felt when it issues reports and recommendations on federal policy, industry standards, and workplace culture. CSB has released five such reports this fiscal year—well above pace from previous years when just nine reports came out between 2011 and 2013. There are 11 open investigations listed on its website, including a Puerto Rico refinery-tank explosion from 2009 and a 2010 ammonia release from an Alabama refrigerated-services facility. But that tally doesn't include some cases that were dropped or resolved without full-scale reports. For example, the board in 2009 opened a probe into a fire at a CITGO refinery that burned for days and left one worker injured. There was hope that the investigation would spur a deeper look into the use of the toxic gas hydrofluoric acid at refineries, seen as a public threat because of the gas's potential to travel far if released (the Center for Public Integrity has covered that issue). The board later identified at least two more cases dealing with hydrofluoric acid (one at the same plant) that weren't closed. Since the CITGO case was opened, however, lead investigator Rob Hall left CSB (over frustration with management, he has said), as have other investigators. Recommendations were made in 2009, but the full case is currently sitting idle and Managing Director Daniel Horowitz said it's one of a number of cases that is under review, possibly to be combined into a larger study on refinery issues that would include other refinery incidents. Jeff Wanko, an investigator who left CSB in 2011 to take a position with the Occupational Safety and Health Administration, said in an interview that it wasn't clear if that project would ever get off the ground again. "I think you'll find that investigations like that, they're going to flounder," Wanko said, because investigators can't re-create the findings just from paperwork. And closing investigations isn't much good, stakeholders say, if it's happening years after the accident. It took CSB four years to complete an investigation into the Anacortes-Tesoro refinery explosion in Washington state that killed seven people, prompting a rebuke in February by the state's two Democratic senators and Rep. Rick Larsen. Mike Wright, director of health and safety for the United Steelworkers, said that pattern doesn't help anyone. "When the board does a report, normally it's a pretty good product," he said. "It just takes so long that its utility is greatly diminished." Former board member Beth Rosenberg, who left this spring after serving just 17 months of a five-year term, said investigations become more difficult the longer they take, but delays also means solutions don't materialize. "Priorities fade," she said. "You lost momentum. When an accident happens in the first year there's interest and energy to fix whatever caused it. After that, other priorities become more important. You've got to strike while the iron is hot." The backlog isn't new—a 2013 Environmental Protection Agency inspector general report found the Chemical Safety Board was "not consistent in accomplishing its objective to complete timely investigations." But it's become a potent piece of ammunition for critics who say that the board is deteriorating under Moure-Eraso's leadership. A House Oversight and Government Reform Committee hearing last month aired plenty of dirty laundry and an accompanying report alleged that Chairman Rafael Moure-Eraso and other CSB executives were bullying employees, blocking political investigations and forcing experienced investigators out the door. It wasn't the typical brand of partisan attack from Oversight Committee Chairman Darrell Issa—Democrats joined in the criticism of Moure-Eraso and the EPA inspector general raised questions about production during his tenure. Issa and five other Republicans subsequently signed a letter to President Obama calling for Moure-Eraso's removal. There's been no public follow-up from Congress or the White House yet, but internally CSB leadership is working to improve morale and bolster its image. All the while, that investigative backlog continues to loom over the agency at a time when the White House has made chemical security a priority. Current and former CSB employees who spoke to National Journalsay the slowed pace is the result of a dysfunctional body with an "abysmal" atmosphere. Some employees are even counting down the remaining 11 months of Moure-Eraso's term, or hoping his time is cut short (the chairman has said he won't resign). "The agency is so far behind on its work and with such a low level of productivity," said one employee, speaking anonymously for fear of reprisal. "When you have a demoralized workforce, it doesn't translate into them feeling a sense of urgency or energy in the work they're doing.… If we wait 11 months, there may not be an agency left." Management, however, sees things differently: The backlog exists, but it's slowly being eased with better and more substantive reports. A small staff and budget makes it difficult, but the reports being produced now deal with policy and have the power to make industry-wide changes. "We're on the job," said Moure-Eraso, even amid the political commotion. "We are committed to continue doing our reports and make recommendations that are going to prevent explosions and prevent people from dying." The backlog existed at the start of Moure-Eraso's term in 2010 and the pileup began under the chairmanship of Carolyn Merritt and interim Chairman John Bresland. According to CSB management, there were 22 unfinished cases at the start of his term, compared with just 11 now. Moure-Eraso has explained the backlog as the result of a budget shortage and a small staff. And while that may be true—CSB's fiscal 2014 budget was roughly $11 million and it has around 40 employees—the budget and staff were also small in previous years when investigations were cleared in a year or two. In fact, there's little appreciable difference in the board's budget and staff compared with the high-water mark of 2007, when 11 investigations were completed (including, at the time, the CSB's longest). There were 17 investigators on staff that year, compared with 19 in 2013, and the budget today is roughly $2 million higher. Aside from a dip between 2006 and 2011, the investigative staff has in fact grown. So what's changed? There are more—and more complex—investigations going on, highlighted by the CSB's controversial entry into the Deepwater Horizon blowout in the Gulf (typically CSB wouldn't deal with offshore incidents, but ventured in after a congressional request). It's that report, Moure-Eraso said, that demonstrates what CSB is doing well and why its investigations must take so long. The first two volumes of the report approved in June, he said, were the only ones to use a full set of testing data to determine why the rig's blowout preventer failed and develop solid recommendations on how to prevent similar incidents. It's part of a "substantial evolution" in how CSB works, moving from industry consultations to policy matters that take a bigger bite. "We've learned to look at the root causes, we have to look at process safety management, rather than just the engineering lapses that we found," Moure-Eraso said. "We have to look at policy issues and we have gotten very good at this … I believe we are being an agent of change." For example, he said, a report released last week on an explosion at AL Solutions metal-recycling plant in West Virginia included recommendations to the Occupational Safety and Health Administration on how to address combustible dust, an issue CSB has made a priority in recent years. A 2013 report on an explosion at a fireworks-disposal operation in Hawaii included first-ever recommendations on safety conditions for federal contractors. Sources inside and outside CSB questioned how much more substantial the reports were, adding that the delays render some of the impact moot. That explanation, they say, is a spin from a management team looking to shield itself from well-deserved blame for leading the agency astray as political pressure looms. Employees told National Journal that debate is discouraged within the CSB and that management has forced experienced investigators to leave. And, they say, Moure-Eraso and managing director Daniel Horowitz seem unwilling to simply put together a public document listing the status of ongoing investigations, possibly to blunt negative press. Board members have long pushed for an action plan to be hashed out in the open—Mark Griffon and then-member Rosenberg asked for a public agenda meeting at a 2013 meeting, but were overruled by Moure-Eraso. In an interview, Rosenberg said the incident was frustrating—as a board member, she felt a right to have some input on CSB's direction. "We got updates, but no big-picture ideas. And we're supposed to be doing the big-picture stuff," she said. It's an effort that goes back well before Rosenberg's tenure. Former board member William Wark, whose term ended in September 2011, said in an interview that he and fellow board member William Wright (who left the same time as Wark) would ask for a management information system so often "it became a joke of sorts." The amount of effort being devoted to investigating the Deepwater Horizon spill—upwards of 30 percent of the budget and at one point 55 percent of man hours, according to Wright—heightened that desire. Even with 16 or 18 investigations going on under Moure-Eraso, Wark said he had no idea of an overarching plan. "This is Management 101 and it wasn't being addressed in any sense of the word." While he didn't agree with the Deepwater Horizon investigation—it was one where there was little "value-added" potential, he said—Wright said the board's other work during his time had a big impact and built a strong reputation. But the problems that have surfaced since then have tarnished the brand, possibly past the point of repair. "During my tenure, I was pretty proud of a lot of the work we had done prior to [Moure-Eraso's] arrival," Wright said. "Now, I'm embarrassed to say I was there. It's become a bit of a laughingstock." Coming next week: How the Chemical Safety Board Came Apart.